The Girl With The Spider Tattoo: TRUE SOL 100% Pure Yacon Syrup Review and Giveaway! Ends 9/15/14! TRUE SOL 100% Pure Yacon Syrup Review and Giveaway! Ends 9/15/14! Distilled from the Peruvian tuber yacon, fresh pressed from the yacon root-- contains up to 50 percent fructooligosacharides, or FOS. FOS, classified as a prebiotic, is a non-caloric sweetener and also a fiber source. According to a 2009 Scientific study, daily intake of yacon syrup produced a significant decrease in body weight, waist circumference and body mass index. Speeds up metabolism to combat excess fat and regulates the hunger hormone, making you feel full longer. I've tried some other brands of Yacon Syrup and not all of them tasted too great. This particular one, however, didn't taste as bad as some of the others. I've taken it by the spoonful, eaten it on pancakes, and even used it in my tea and coffee. I also like that it can be used to replace honey, sugar, and agave syrup in recipes. I plan on using it in several different things. I love that it is a low glycemic sweetener, speeds up metabolism, and also helps you feel less hungry. It also helps when I'm craving something sweet. 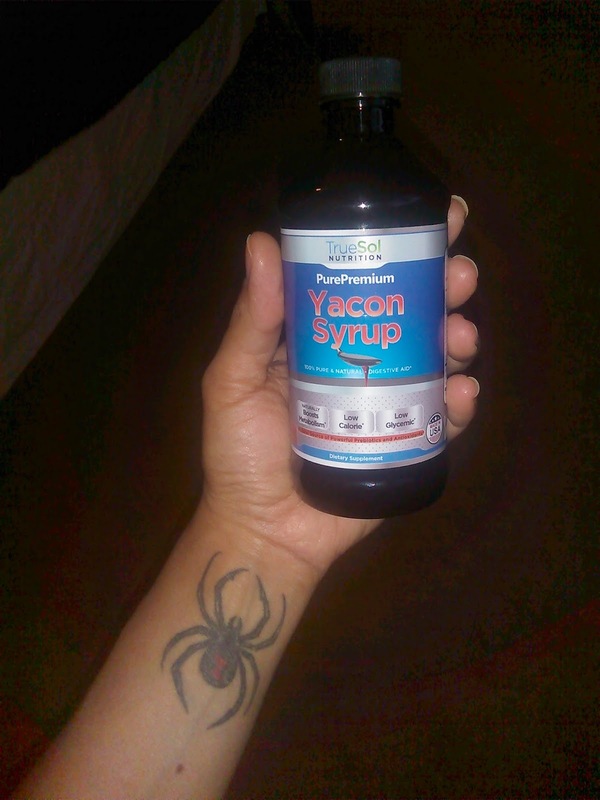 I'll eat a bit instead of grabbing something too sugary and fattening, not that I do that often, but I do get cravings from time to time and this Yacon Syrup helps me stay on track with eating healthy. It's also a great source of fiber! That's always great to have in your diet. Have I noticed any weight loss? Not yet, but I haven't been using it for too long. Enter my rafflecopter below for your chance to win 1 free bottle of Yacon Syrup! Absolutely free to enter. None of the entries are mandatory. Must be 18 or older. One winner will be chosen by random.org. Winner will be contacted via email to be notified. If you choose not to provide shipping info on rafflecopter and wish to be emailed only, you will have 24 hrs to respond before a new winner is chosen. TRUE SOL is responsible for prize fulfillment.